It’s 3 p.m. on a Saturday, and the minute I step onto the laminated wood floors of Forever 21, I’m blinded by the fluorescent lights. Hoards of desperate bargain hunters elbow past me, and I want to pivot on my heels and walk out the door. But the beat of Icona Pop’s “I Love It” lures me deeper into the madness. This isn’t retail therapy; this is mayhem. This is the jungle that is Forever 21. 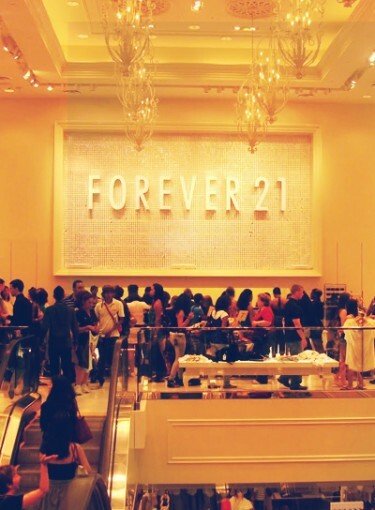 Click here to see how to survive the Forever 21 jungle. I know I sound dramatic, but we can all agree shopping at Forever 21 can be pretty intense. Sometimes I feel like the only way to find something awesome is by grinning and bearing my way through a stress-induced panic attack. But it doesn’t have to be that way. At least, not when you use the tricks of the professional styling trade. Celebrity stylists and fashion experts — people who shop for a living — know that there are real gems at Forever 21. Even better, they know how to shop at the discount fashion mecca without letting the crowds and the mess get to them. So, I pumped the best in the biz for their secret tricks — the little bits of wisdom that’ll help me (and you) make shopping at Forever 21 a saner experience.